MONDAY, MARCH 1, 2010 AT 7:00 P.M.
A. Approval of February # 2 Payroll in the amount of $36,619.45. B. Approval of Claims in the amount of $19,163.33. C. Approval of Minutes of the February 15, 2010 Regular Meeting. D. Approval of Cemetery Deeds: Edward J. or Billie J. Lincoln, 1 space; Orval or Jane Hixson, 5 spaces. E. Approval of Resolution No. 2010-06, a Resolution supporting HB 3054, Municipal Fiscal Impact Act. -- The item was eventually tabled to get an additional bid on softball field grading and drainage but could come back soon on a special session as improvements to the city park softball field are time critical to support youth league and tournament play which is set to start the 2nd week of April. The recommendation is to replace the softball field lights ($10-$14K uninstalled with the city to install) and do significant dirt work / french drains / aggregate soil for (~$9K), backstop and fence repairs. The local youth softball league with girls teams from U6 - U16 is scrambling as their use of the softball fields at CHS will be limited after June this year. 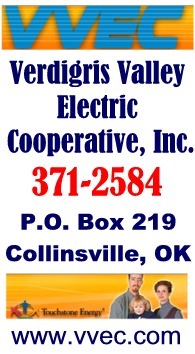 The Collinsville Girls Softball organization is searching for a new alternative field location (example dance fundraiser Nov. 2009). Adding a softball field at the Sportsplex (near ECC/Herald) would take space from both the youth baseball & soccer organizations and is unlikely. Several other park improvement options were briefly discussed but only the softball field field improvements have received recommendation (at this time) by the Park Board. * "Girls Rock Collinsville" (Feb. 26th) was successful with lots of customers in participating stores .. will likely try again quarterly. * INCOG Transportation meeting indicates the potential of federal stimulus funds for transportation. City is trying to get funds to do asphalt overlays for 19th, 12th and Broadway from that source. * Atlanta Crime Prevention training here was successful and provided positive publicity. * Chamber of Commerce moving (in with Collinsville Downtown, Inc) into former City Annex building ... across from City Hall. * New trash truck arrived last week. * Architect Jim Grabbert and others met on jail design again and expect design to be complete in a few weeks. * Census worker training has been held in City Hall in recent weeks. * City Hall filter changes delayed by lack of correct size lift. Hope to borrow one from school for occasional use. POSTED BY: Angela Long -- DATE: February 26, 2010 TIME: 4:00 p.m.
A. Approval of February # 2 Payroll in the amount of $22,095.97. B. Approval of Claims in the amount of $241,389.47. D. Approval of Budget Amendment in the amount of $4,104.26, insurance proceeds for 1998 Chevy S10, Water Treatment Dept. * Mag meter (instead of a sonic meter) for increased accuracy. Clay (with Holloway, Updike & Bellen) mentioned that the UV equipment delivery is likely delayed til June and little work has been done recently due to poor weather conditions.